Workshop details for the rest of the year are listed below. Bear Medicine is filled so another one might be scheduled next year. The Four Chambered Heart in October is a powerful workshop. We will be exploring a variety of issues, however, one of the big ones will be TRUST...our self first and foremost that enables us to trust others. I find it interesting that we struggle with present centeredness which supports trust and intimacy. I wonder what we will do as a world when we realize that the solution to intimacy and trust resides inside ourselves. 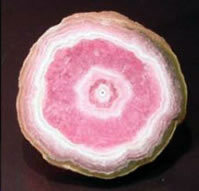 Rhodochrosite is a manganese carbonate mineral with chemical composition MnCO3. In its (rare) pure form, it is typically a rose-red color, but impure specimens can be shades of pink to pale brown. The streak is white. Its Mohs hardness varies between 3.5 and 4. Its specific gravity is 3.5 to 3.7. It crystallizes in the trigonal system. The cleavage is typical rhombohedral carbonate cleavage in three directions. Crystal twinning often is present. It is often confused with the manganese silicate, rhodonite, but is distinctly softer. Rhodochrosite forms a complete solid solution series with iron carbonate (siderite). Calcium, (as well as magnesium and zinc, to a limited extent) frequently substitutes for manganese in the structure, leading to lighter shades of red and pink, depending on the degree of substitution. It is for this reason that the most common color encountered is pink. Rhodocrosite bestows a positive, enthusiastic attitude for life that encompasses an impersonal love of all life. It is sometimes referred to the stone of love and balance. It contains a pulsating electrical energy which emits the strongest power in the universe, the power of love. The energy of rhodocrosite is encompassed by the presence of the heavenly energies filled with the golden sphere of light; it assists in creating new worlds for the user--worlds filled with love and dreams. Used during the meditative state, one may melt into the sphere of golden ecstasy and/or encounter one's twin soul when so directed. It is a stone for healing the earth and for showing love to the Mother of us all. It helps one to serve the planet in her time of need, allowing for one to recognize that the responsibility is actually a joy. Rhodocrosite encourages activity, liveliness, eroticism and spontaneous expressions of feeling. It has a mood lifting effect by bestowing energy and making us light and cheerful. It generates energies and purifies the base, sacral, and heart chakras into harmony. For energizing, it acts with expediency on the physical, astral, and mental planes. For purification, it acts to cleanse and to renew. It balances the emotions gently and quickly, providing stability or order and structure to the mind. It supports wakefulness and a dynamic approach to life. It facilitates balancing of the mental process such that the attunement to the higher self can be attained, and one's awareness and spirituality can be enhanced. It assists in expanding one’s conscious awareness of duality and allows for recognition and insight with respect to the methods by which the pervasive presence of duality affects one's life. It also assists one in attainment of the solution to the puzzling concept relating to the contradiction of the duality of nature. It further assists one in accelerating the expansion of one's consciousness, and to both understand and initiate the practice of intensive relaxation, acceptance, and balancing. The crystalline structures are especially beneficial in these areas. It removes tendencies towards avoidance and denial and helps one to accept and integrate new information while maintaining clarity of intellect with practicality. It assist one in the re-interpretation of self to dissolve the various interpretations we’ve collected over time and return to a state of being fully in the moment. It increases long-term memory. One is better able to access memories from the present life, as well as from past lives. It enables one to remember what one his supposed to be doing in the present moment: to stay aware, be present and be relevant. It assists in balancing the male/female aspects of one's character and physical body, providing for strong, clear, and tolerant energy. It acts to stimulate the energies of the body, encouraging the maintenance of the optimum state of health. It has a gentle balancing effect which can maintain the etheric energy at a beneficial level and can help to prevent sickness. An elixir taken internally has assisted in the relief of internal infections, such as ear, sinuses, ulcers, inflammations. It can provide a soothing action to the skin. It can also be used in the treatment of various kinds of elimination problems, to strengthen the walls of the intestines and to promote the production of the proper range of gastric fluids to enhance digestion. It has been used to balance the energies of the heart and to stabilize the heart and pulse. It can be used in the treatment of thyroid imbalances. An elixir is quite effective. For further information, kindly call Lauren at 216-272-8438 or e-mail lauren@therockgirls.com to reserve a space in the circle. Please send a check, payable to The Rock Girls inc. Mail the check to The Rock Girls inc 26635 Amhearst Circle #201 Beachwood Oh 44122. Once paid-in-full you will receive info on your stay at Camp Asbury. Due to the workshop focus and the unique facilities, the attendance will be limited to 25 people. The Buffalo Medicine workshop is an initiation – a birthing process to more fully be who you are in the world. The focus is to discover the inner wisdom of your soul that knows how to combine right action with right prayer. Buffalo Medicine leads us to discover our ability to initiate , support and create order, while being open to outcome. Buffalo medicine is about the essence of buffalo spirit. Buffalo is a symbol of abundance and manifestation through co creation with Spirit. Part of what White Buffalo Woman taught the Lakota is that they did not have to struggle to survive. By uniting the mundane and the divine appropriately, all that would be needed would be available. In this way we don't have to “bull” our way through life. The path opens and flows easily. Buffalo are also in tune with the seasons and the timing of Nature. This doesn't mean we should sit back and do nothing, but rather that we should do what we have to do and then let events take their natural course. Buffalo medicine is also about give away and gratitude for what you already have. The quickest way to stop the flow of abundance is by failing to honor that which has already come to you.